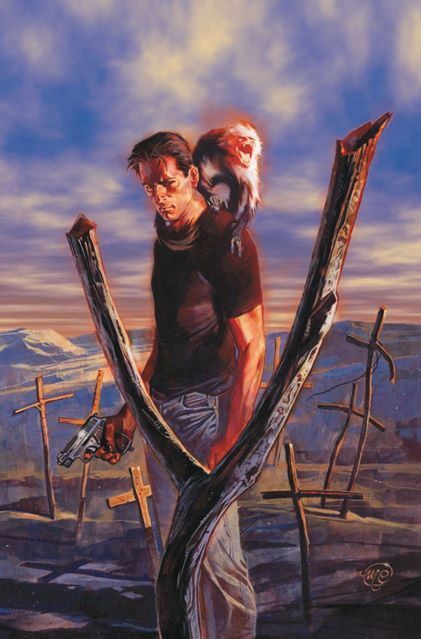 A film adaptation of Brian K. Vaughan‘s brilliant comic series Y: The Last Man has been in development hell for years, and now the rights might finally revert back to Vaughan and co-creator Pia Guerra. For those who haven’t read the series (and you absolutely should because it’s amazing), it takes place in a world where all men have died except for one, college student/amateur escape artist Yorick Brown (the “Y” refers not only to his name, but that he has a “Y” chromosome). The adaptation has gone through multiple directors including D.J. Caruso (Eagle Eye), which also had Shia LaBeouf attached to star, then moving on to helmer Louis Leterrier (Now You See Me), and a year ago to Dan Trachtenberg, who directed a Portal fan film. Because none of these projects have ever started, New Line Cinema’s option is running out, and so it might go back to Vaughan. Hit the jump for more including a status update on the adaptation of Vaughan’s Marvel Comics series Runaways, and his spec scripts for Roundtable and The Vault. I’d be perfectly happy with this. I don’t need a Y movie, especially since it probably wouldn’t make a very good one. It would either have to be truncated or end on a cliffhanger, and both would probably be unsatisfying. Even a TV series feels unnecessary, although it wouldn’t be awful if it went that route provided the right people were running it. As for Vaughan’s other projects headed to the big screen, he thinks his series Runaways isn’t going to happen, but admits he hasn’t spoken to Marvel in some time. However, screenwriter Drew Pearce (Iron Man 3) somewhat concurred last year when he said that The Avengers spiked Runaways because Runaways didn’t fit into the studio’s team-up model, although it’s still possible it could be a Phase Three picture. Vaughan also said he thought his spec scripts Roundtable and The Vault were dead, but he “just heard rumblings about each recently.” For those who don’t know, Roundtable is about a group of knights who have to save the Earth in the present, but the task falls to British entertainers since they’re the ones who are knighted these days. When we reported on The Vault over three years ago, it was described as “A post-apocalyptic heist movie involving the real-world Doomsday Vault in the Arctic, The Vault is Ocean’s 11 meets 2012/Children of Men.” I’m fine with Y: The Last Man not being a movie, but these two need to happen.